FrameworkPascal Home - Framework Computers, Inc. TMT Development Co.
OWL compatible units provides an effective solution for migration of code written for Borland Pascal OWL and Turbo Pascal 7 Object Pascal with minimal changes to the original Windows 3.1 or DOS targeted code, with the added advantage of allowing non object oriented code as well as code written text mode to be compiled into 32 and 64 GUI OWL applications. The new OWL units are compatible with our existing units which include multi media support units, ODBC SQL units, MAC address based security technology as well as special CRT unit which can handle code written for DOS text and graphic modes, mixed with new 32 bit graphics and any existing units, and compiled as Windows 32/64 GUI applications. Legacy code can be compiled with OWL model applications (demos) such as Windows MDI basic applications starting from a running model applications to which legacy code can be can be quickly added. Unlike the original Borland OWL 16 bit units which relied on a significant amount of ASM "acrobatics" the FrameworkPascal units are written entirely in Pascal. That is also true for the FrameworkPascal OWL messaging system which is written entirely in Pascal instead of relying on "mysterious" ASM manipulating the Internal VMT and DVMT (Dynamic Virtual Method Table) in the original 16 bit units and as far as we know, every other Object Oriented Programming Compilers which provide a messaging system. Having a messaging system written in an upper level language which relies on virtual methods rather then the internal DVMT provides programmers with greater control over the behavior of Windows in general as well as in special cases where Microsoft impose limits adn special behavior with specific GUI traits which can be impossible to override with other compilers. Build applications and DLL's with FrameworkPascal 6.1 Multi-target compiler for the following operating systems: Windows 95, 98, ME, NT, 2000, XP, Vista. (GUI, Console, DLLs and CPls), and MS-DOS 32-bit protected mode. MS-DOS applications included DOS-extenders, such as PMODE, PMODE/W, as well as WDOSX, CAUSEWAY and DOS/4GW. Built-in assembler supports the full 32-bit assembler Instruction set. Support for Intel MMX and AMD 3DNow instructions for creation of fast multimedia applications. FrameworkPascal 6.1 Multi-target closely follows Borland Pascal syntax and has similar run-time libraries. Most of the standard run-time units are supported for all targets. Hence one can recompile old MS-DOS text-mode Pascal sources to create modern Win32 or OS/2 console applications. Drop Turbo/Borland Pascal source for DOS into the Windows function based Win 32 GUI taking advantage of full API and GUI access. Advanced STUB file support. Allows DOS programs to be inserted as the STUB program into Win32 executables, instead of default ones. Enhanced Graph unit provides SVGA banked and LFB video modes support in MS-DOS executables and uses Microsoft DirectDraw features in Win32 applications. Powerful set of Run-time Library units, including extended math library, complex arithmetic, ActiveX, DirectX and OpenGL units. FrameworkPascal 6.1 Multi-target includes many examples for all compilation targets. A comfortable multi-window editor, which allows one to edit and run sources. A handly context-sensitive help system. A powerful search/replace engine, which allows one to find specified text in open windows and subdirectories. An easy to use compiler options setup menu. The FrameworkPascal 6.1 is an extremely fast independent Windows and 32 bit Extended DOS compiler as well as an optional compatibility platform providing an alternative function based API/GUI interface and a the ability to preserve non Windows executable file structures. It uniquely and unequally provide the ability to preserve programming and design investment in function based and top town design under Windows with out compromising access to the windows API overcoming the limits and complexity imposed by Microsoft's event driven mandatory methods. 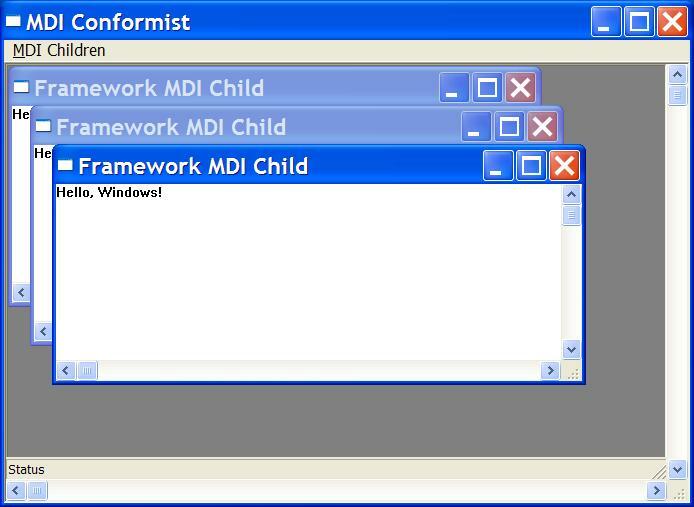 FrameworkPascal 6.1 is unified with a Windows' parallel API platform which is independent of Windows as well as able to run in it. The compiler capabilities were extended allowing older programs written for non Windows platforms in Turbo Pascal, Apple Pascal, ADA and even C which were design for an interrupt and function based operating systems to access the full Windows API GUI without the need to restructure the excludable file format for the event driven passive entry points forced by the Windows GUI. The FrameworkPascal 6.1 supports long file names for DOS target under Windows and 64 bit file size with Windows 2000 server conventions. OS/2, discontinued by IBM, is no longer supported in FrameworkPascal but you may contact us for availability of legacy OS/2 tools. Call Framework Computers, Inc. for availability, licensing and pricing information. Owners of TMT Pascal 4 & 5 can obtain a personal upgrades, contact us for details. Include your full contact information, address, phone number and company information. Please contact us by phone if you do not receive a reply to e-mail on the same day. FrameworkPascal include dedicated software support. Software products are shipped via the Internet and are automatically installed. High performance extremely fast 32-bit Pascal Compiler. '+:=' and '-:=' C-style operators. Overloading of functions and standard operators for new types. Interface declarations in main program. It supports many popular MS-DOS 32-bit extenders (such as PMODE, PMODE/W, WDOSX, CAUSEWAY and DOS/4GW). Enhanced Graph unit (VGA/MCGA & SVGA banked and LFB modes up to 1600x1200 TrueColor). IDE for Windows 32-bit Operating Systems.